Inside the University Theatre, a troupe of clowns dressed in military uniform await their audience. The clowns juggle, sing, and crack jokes to warm the audience up for the night’s main event: the transformation of an ordinary citizen into the perfect soldier. 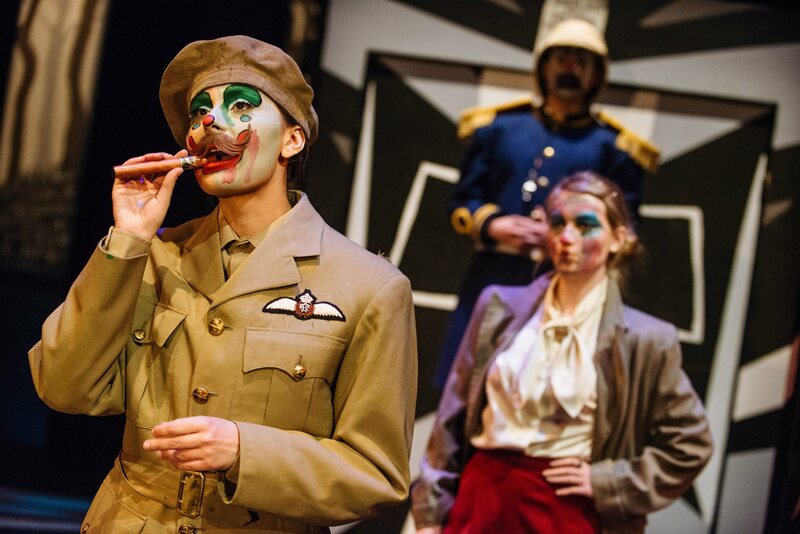 Directed by Tim Sutherland, U of C’s School of Creative and Performing Arts’ production of Bertolt Brecht’s Man Equals Man is an uproarious spectacle of slapstick and danger. Set in British Colonial India, Man Equals Man stages the story of Galy Gay (Natasha Strickey), a lowly porter, who is thrust into the ranks of the British Army by three incompetent privates. Needing someone to pass off as their fourth man during roll call, Uriah Shelly (Andy Weir), Jesse Mahoney (Ahad Raza Mir), and Polly Baker (Onika Henry) enlist Galy to be their stand in for the night, whereafter he will no longer be needed. But when their comrade Jeriah Jip (Connor WIlliams) goes missing indefinitely, the privates set out to turn Galy into the soldier they need him to be. Despite the presence of firearms, there is little violence that actually takes place on stage. And that is the point. For Brecht, it is not firearms, but rather political ideologies that pose a grave threat to all persons of the world. After all, a gun cannot fire without someone to pull the trigger. Here, what Brecht specifically fears is the influence of state propaganda on citizens. Though he resists at first, Galy is eventually won over by a narrative that glorifies the soldier as an inherently noble figure worthy of many rewards. Over time, the narrative digs deeper under Galy’s skin where it re-positions his values to align closer with those of the state and its armed forces. Galy’s identity effectively becomes estranged from his biography. And it is from this metamorphosis that violence emerges as Galy becomes a soldier on the front; a weapon of the state. Accordingly, Sutherland’s circus positions war as an elaborate production. Translated within this context, a soldier’s uniform becomes nothing but a costume that anyone can wear, even a clown. By highlighting how persons and groups assign meaning to the mundane, as opposed to the mundane possessing an inherent value, Sutherland undermines the symbolic authority of the uniform. And despite changing into costumes (e.g. ninja attire) that suggests otherwise, the clowns remain British soldiers throughout the entirety of the play. This contradiction in appearance emphasizes Brecht’s concern over the sort of false realities that ideologies construct and attempt to present as truth in the face of actuality. This is a furiously high-spirited circus that engages on all fronts through physical humour, music and dance. And everyone in the cast is on board here, even the actors in the background who are giving as much as those leading the scenes. There is a lot of great character work on display, a varied mix of personalities and antics. The ensemble’s total commitment to the piece truly elevates this production to something quite fantastic. Strickey displays a great amount of quirk and charm which makes her an absolute joy to watch on stage. Her facial expressions and mannerisms read very clearly from the stage. Along with her comedic timing, Strickey is also adept at capturing the dramatic tones of the play. Weir, Mir, and Henry share a delightful chemistry together. Although, the actors would benefit from better enunciation and projection as sometimes we lose their dialogue, particularly with some of the accents at work. Set and lighting designer Anton de Groot’s work is visually exciting and very much in tune with the eccentric quality of the production. Funny, thought provoking, and certainly unique, U of C’s School of Creative and Performing Arts’ production of Brecht’s Man Equals Man is a lively experience that both entertains and challenges its audience. The University of Calgary’s School of Creative and Performing Arts’ production of Bertolt Brecht’s Man Equals Man runs at the University Theatre, Feb 17 – 28, 2015.